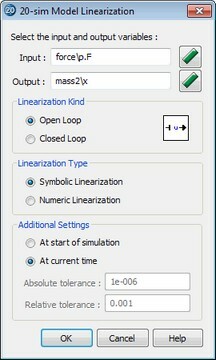 When using numerical linearization, absolute and relative tolerances can be set. In this section is explained how 20-sim uses these tolerances to derive a linear system for the model equations. Suppose you have chosen the following tolerance values. The absolute tolerance is necessary only if the input or state is zero. In that case the contribution of the relative tolerance is zero an will not give a contribution to the algorithm. There is however a problem with the absolute tolerance. Suppose the input = 1e-12 and the state = 1e+6 (ill-scaled model). For the input an absolute tolerance of 1e-6 will yield a far too large deviation, while the same absolute tolerance is negligible compared to the state. Only if both the state and input are nonzero the absolute tolerance can be made non-zero to yield good results.